Done by a former member of the The Tragically Hip, Davis Manning, this mural in a back alley behind a tattoo parlor in Kingston, ON, depicts the impact the band was having on his relationship with his girlfriend. 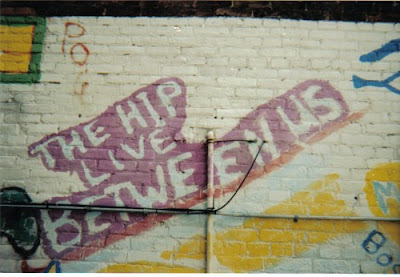 In 1986 Manning eventually chose his girlfriend, while the band went on to become superstars in Canada.Originally not realizing that Manning drew the mural (thinking instead that a fan did it and that they were actually making it big), the band thought it would be a good album name, using “live” as an adjective rather than a verb. 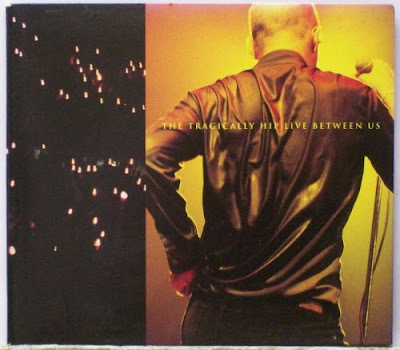 They named their 1996 live album “The Hip Live Between Us” after it.